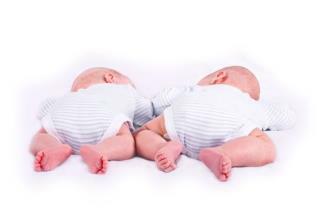 (Newser) – A woman in Florida has pulled off what her obstetrician figures to be a 1-in-5-million longshot by giving birth to twins, reports the St. Petersburg Times. Why the long odds? Andreea Barbosa has a rare condition called uterus didelphys, meaning she has not one uterus but two. That in itself can cause infertility, but Barbosa not only became pregnant, she did so in her separate uteruses at the same time. Twins Nathan and Natalie, along with mom, are doing fine. I wonder if they will grow up demanding separate rooms.